Thanks to the huge donation from PUMA employees and manufacturers we were also able to help the flood catastrophe victims. 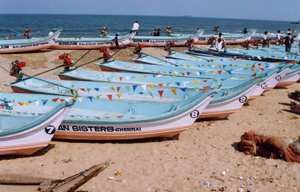 After a long search to find an appropriate project we decided to help the fishermen from the region Tiruvottiyur (Southern India), to rebuild their livelihood. 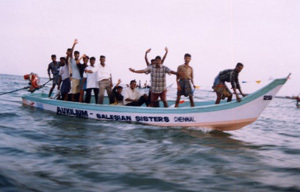 Through the DON BOSCO MISSION we were able to buy nine new fishing boats with equipment (outboard motor , 2 types of fishing nets). We hope that we have contributed to an important self help scheme. Furthermore, as part of this project we were also able to contribute a large sum to “Doctors without Borders”.